Warwickshire batsman Freddie Coleman must serve a two-match ban for showing dissent to umpires in a Second XI match - his second breach of England and Wales Cricket Board rules in two years. Coleman was given a two-game suspended sentence by the ECB in August 2013 for attempting to alter the condition of the ball after sucking a Murray Mint. But he fell foul again in this week's Second XI Championship match at York. He has been suspended for limited-over games on Friday and Saturday. Edinburgh-born Freddie Coleman, signed by Warwickshire in March 2013, has played in one T20 and 16 one-day internationals for Scotland, but is still to make his first-class debut for the Bears. 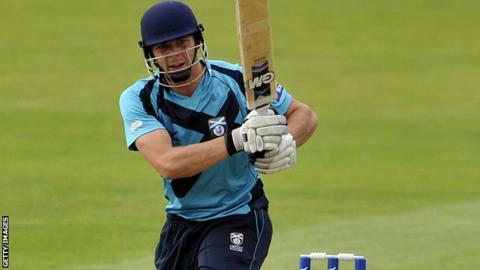 He has played four times for the county in both the One-Day Cup and the T20, but not so far this season, and has played a total of 84 Second XI games in the three different formats. Umpires Steve Garratt and Ian Marland reported the 23-year-old Scotland international for the offence of "showing dissent at an umpire's decision by word or action", a Level One breach of the code, during the game against Yorkshire. Coleman's punishment two summers ago, for a Level Two breach of the code, was three penalty points and a suspended two-match ban. That suspension now comes into effect, ruling him out of the Bears' final T20 Blast North Group game with Yorkshire at Headingley and the One-Day Cup game against Nottinghamshire at Welbeck Colliery on Saturday.